Hershel Thomas Daniel (1905-1973), was born May 15, 1905, son of James L. Daniel, and Chlora Daniel, at Pittsburg, Johnson County, Arkansas. He married Rachel Stilley on October 3, 1924. They had a son Daniel Barton Daniel (1928-), and a daughter Barbara (1935-). H. T. Daniel began dealing in the 1920's, though he claimed 1915 when he was only ten years old, and continued at different cities in Arkansas into the 1960's. He advertised regularly in Hobbies Magazine. He operated a store under various names and in 1940 after moving from Dardanelle it was called like Mercer's Ohio shop, the Curio Store, located at Hot Springs, Arkansas. Daniels drummed up a lot of business advertising with whole page ads on the inside front cover of Hobbies Magazine in 1939. One of his regular customers was Samuel Dellinger, Curator of the University of Arkansas Museum. Another was Judge Harry Lemley of Hope, Arkansas, who amassed an extensive collection of Indian artifacts. Fig. 1. Business envelope of Hershel T. Daniel postmarked with Scott No. 552 (1922-1925) Precancel "Farmington, Arkansas" c. 1925. Courtesy the Lupia Numismatic Library. 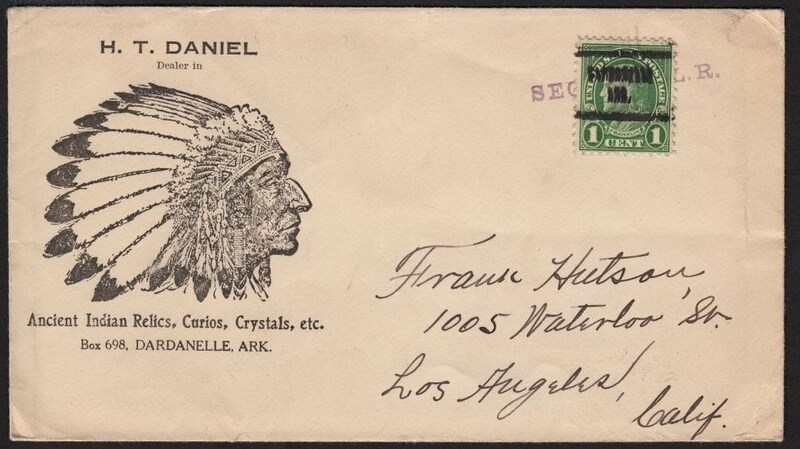 It is curious that he used a precanceled postage stamp from Farmington in Washington County 120 miles northwest of Dardanelle, along Lake Dardanelle, Yell County. Fig. 2. 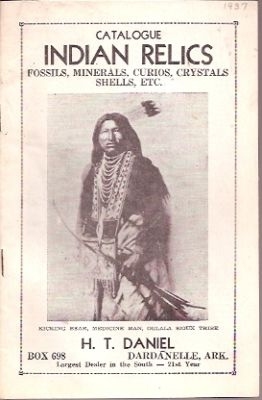 1937 Catalogue, Indian Relics, Fossils, Minerals, Curios, Crystals, Shells, Etc. Fig. 3. In 1941, he published, Catalog and Price List, Indian Relics, Coins, Bills, Gems, Fossils, Minerals, Hobby Material, Etc. 31 (1) pages, illustrated with photos. Reprinted by Hothem House. His residence in 1944 was Hot Springs, Arkansas, where he was listed in the City Directory as an Antique Dealer. He died at the age of 68 years, 4 months, and 11 days, on September 4, 1973 at Lamar, Arkansas. John C. Whittaker, American Flintmakers: Stone Age Art in the Age of Computers. (University of Texas Press, 2004) unpaginated. See part 3, Daniel, Howe and Others. John C. Whittaker, American Flintmakers: Stone Age Art in the Age of Computers. (University of Texas Press, 2004) unpaginated.